I wish I had a soup recipe to share today. Hell, I just wish I had some warm soup to eat right now. It is COLD y’all. Really cold. Makes me wish, even more, that we hadn’t come back here from our amazing cruise! Did you know that a lot of the places in Central America never have a winter? It’s pretty much warm there year-round. If you want a little re-cap of our cruise you can find it here. Instead of soup, I have another wintry treat for you. Fall and winter are, you know, hunting season. J got two bucks this season, which means our freezer is full of venison and I have to try and come up with creative ways to cook it. Thus we have…venison meatballs that I have now dubbed buck balls. When I posted a pic of them the night I made them and called them that it seemed to cause some confusion as some thought I was literally cooking buck balls. Um, no. I may be a little adventurous, but that is something you will never find in my kitchen or as a meal. From any animal. Just sayin’. You will, however, find a whole slew of different kinds of meatballs. I loves me some meatballs. Turkey, chicken, beef, pork, and now…venison (buck)! They are just so easy to prepare and so tasty!! I made these with marinara sauce because J loves marinara. 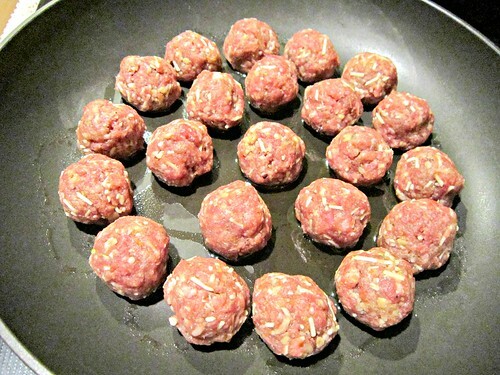 Mmm…buck balls, ready to cook!! Combine just a few ingredients, roll ’em into balls and toss ’em in a pan with some olive oil. And then when they’re done cooking…smother them in marinara. How much easier can dinner get?? 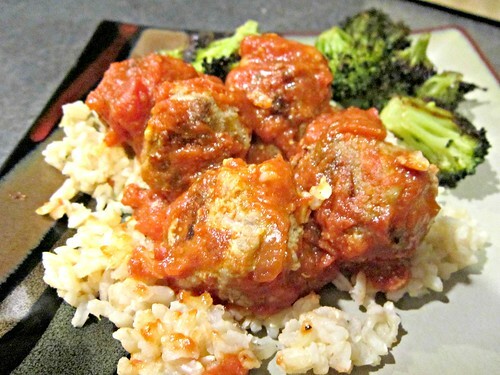 This particular recipe makes quite a lot of meatballs, so unless you are feeding a large family or want a couple of meals/days worth of leftovers, I would cut it in half or freeze half of the un-cooked balls. You could also sub another ground meat for the venison, but if you have access to ground venison I suggest you try it! Slightly adapted from Have YOU Ben Starr Struck? In a large bowl, combine all the ingredients other than the olive oil and marinara sauce. Use your hands to gently, but thoroughly, mix it all together. Use a medium cookie scoop or tablespoon to scoop out even amounts of the mixture, then use your hands to firm up and shape the meatballs. Set them all on a large plate or lined cookie sheet until all are ready to cook. Add olive oil to a large skillet and heat over medium-high heat. Once warm, add the meatballs, in a single layer, preferably not touching. Cook in batches if needed. Cook for 2-3 minutes, or until nicely browned on the bottom and then flip (I use tongs, but you can use whatever method works best for you) and cook another couple of minutes until browned and mostly cooked through. If cooking in batches, remove the first batch to a plate or baking sheet while the next batch cooks, then return them all to the pan. 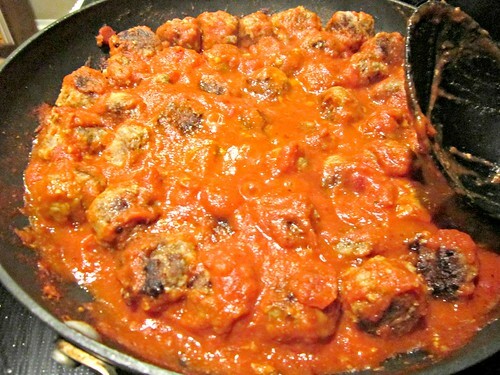 Pour the marinara sauce over the top and gently shake the skillet to make sure all the meatballs get sauce. Continue cooking a couple more minutes until the sauce is nice and hot,and the meatballs are cooked through. Serve over pasta, rice, or other grain.